My 85 year-old mother is rebuilding an existing streambed. The original had a gravel bed - I believe with a liner underneath - but a few substantial floods in the past few years caused a rush of water from properties upstream that dumped all the gravel into the pond below. She has hired a very nice stone worker, but he is not a designer and brought in a mish-mash of four-to-six inch rocks (not river rocks) and it all looks like a bad Flintstones scene. Can someone please give me some guidance on what would look appropriate, yet survive these annual floods. I should note, the streambed is absolutely dry in the summer months, so I don't believe a liner alone would suffice. We have some lovely large stones to form the edges of the stream, but I don't know how to approach the streambed. FYI, we live in Connecticut. Any help is much appreciated! Is there any possibility that you could post pictures. I'm not at all clear on the situation. 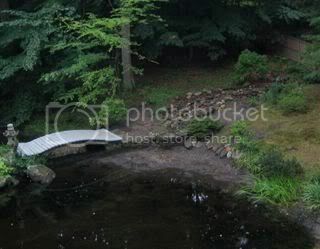 Is this part of Japanese Garden? Which months does this stream bed actually have flowing water in it? Do you know roughly what the grade is and the length of the stream bed? Are you looking for a purely functional solution or an aesthetic one? Is the stream bed relatively straight or winding? I always use rounded rocks for stream beds, material with rough edges always looks inappropriate. I also try to use primarily the same type of stone rather than a mishmash of geologically unrelated stone. If the grade is steep and/or the high flow volume is really high four to six inch material may be too small. In severe situations I would probably look at using boulders to constrain flow, natural catch basins or other methods to control erosion issues in high flow situations. If this is in some sense a natural stream you could also have some regulatory hurdles. If you are on high clay content subsoil you might be able to get by without a liner but I'm dubious especially if one was used initially. The only other option is concrete which is expensive. Streams and ponds are one of the most difficult elements to do really well. For every nice one I see I probably see fifty poor examples. It helps if someone knows at least a little about geology and hydrology and has looked at a considerable number of natural streams of different types with an observant eye. Thank you for your reply, MaineDesigner. I've posted a photo. We are working with a natural stream. It is approximately one foot wide, although she wants to add a small pool at one point, and have it curve a bit. The length is approx. twenty-five feet and the drop a total of about three feet. Soil is not clay. It empties into the pond at the bottom of the photo. There is a waterfall to the right of the bridge. The mud is where the crew dug up accumulated gravel (from the original streambed) and silt caused, we believe, by neighbors upstream who stripped their land of vegetation. The sedimentation is new in the past two years, but we hope sedimentation will subside as construction upstream has died down. The pond edge will be lined with large stones, and the areas outside the stream bed planted to prevent erosion. The stream is natural, and she can only control it to whatever extent nature will allow. It usually runs peacefully Sept-May, and dries up completely in July and August. When we get flooding once a year it will overflow its bounds, and we must accept that. It was, at one point, quite beautiful, with a stone path and a stepping stone or two in the middle. I think the best we can hope for is to rebuild in a way that will look beautiful but may need some future maintenance. In other words, if we put medium river rock in the bed, we may need to recover it from the base of the waterfall after winter flooding. Because of wetland regulations, we can't put in a pump or concrete, although the original work predates regulations, so she can restore. We basically need something that will look attractive during this dry season as well as when the stream flows. It looks like a lovely spot, I hope your contractor will give it the kind of careful attention it deserves. It is a little difficult to tell from the photo but I think you might benefit for some larger stones in the mix. The idea of introducing a slight curve in the stream bed is probably a good one although without seeing the site it is difficult to know for certain. The trick is to find a way to make the bend look like part of the natural topography or a response to an obstacle like some boulders so that it doesn't appear to be an arbitrary aesthetic choice. If you have further question let me know, I'd be happy to assist but I may ask you for some additional photos. As Ted says a few more photo's would be helpful, have you thought of diggng the pond deeper to help retain the water for a longer period and yes LARGE rocks are a must especially if you want the stream to meander as you will need something natural looking to make the stream vere, more photo's please. The Journal of Japanese Gardening has had some very useful articles about rock placement, including rocks on the edges of streams and ponds.